These great photos were taken by Joe Hail. My review of the show is below the images. Photos courtesy of Joe Hail. 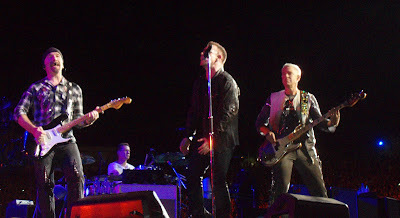 Every time I catch U2 in concert and have to deal with the unbearable gridlock, obnoxious contingent of casual fans who could really care less about the music and the real-life hassles of going to a big rock show, I recall my magical first-time encounter with the Irish quartet. A day or so after I graduated from Cal State Fullerton, I headed to the US Festival on Monday morning, May 30, 1983. I wasn’t very familiar with U2 when I arrived at Glen Helen Park in San Bernardino County, but after catching Bono, guitarist the Edge, bassist Adam Clayton and drummer Larry Mullen Jr. unleash an epic show constructed around the recently-released album “War,” I was an instant convert and have caught the band countless times since in shows here in Southern California, as well as in San Jose, Ca., Florida, New York and Nevada. So it will come as no surprise that I braved the relatively-short trek up to the Rose Bowl in Pasadena last night (Sunday, Oct. 25) to see U2 on its 360° Tour. After all, this is reportedly the only public performance by the band coming to California this year. In terms of the technology, stage design anchored by “The Claw” and the top-notch sound system, amazing. The band’s set list was also strong (check it out below, thanks to O.C. Register music writer Ben Wener, who posted it earlier today with his review on www.ocregister.com). In contrast to those positives, the crowd I dealt with in my section was of the idiot variety. Why go to a show if you’d rather play with your iPhone, cell phone or go on beer runs all night? When the polite security person tells you to get out of the handicapped section and go to your assigned seat, don’t yell obscenities when you are at fault. Okay, now that I have that out of my system, how was U2 – that is the real question. There was plenty of shining moments across the concert for sure. Early in the set, “Get on Your Boots” outdistanced the studio recording on the “No Line on the Horizon” album. And the magnificent “Magnificent” was exactly that. Of the other songs performed last night whose versions really hit home, I count “Beautiful Day,” the blistering “Vertigo,” powerful “Until the End of the World” and “Ultraviolet (Light My Way)” as the definite highlights. I was sadly disappointed by the version of “The Unforgettable Fire” and especially “Walk On” (one of my favorite ‘00s U2 songs); they just seemed flat to me. The title track off “No Line on the Horizon” was also a bit of a disappointment. But make no mistake, the band itself continues to play with a fire and power that defies their 30-year history as a band. With audiences being what they are today – notably bored and distracted by anything not involving themselves – I wonder if any band can really capture an audience for an extended set in a gigantic setting such as the Rose Bowl. After all, a reported 95,000-plus were on hand Sunday night, with who knows how many more watching via a well-publicized streaming of the two-hour concert via YouTube. U2 continues to be a great band, and there is a good chance that those who stood on the floor and crowded near the stage felt the awesome surge that I did when I first felt that unforgettable fire on a blistering day in May more than 26 years ago. What did I think of the opening night’s act? Well, because of the difficulty getting into the Rose Bowl, waiting in line 15 minutes to get a bottle of water, I only caught the last 1/3 of the Black Eyed Peas’ set. The only highlight was watching Slash tear it up on the classic Guns N’ Roses track “Sweet Child o’ Mine.” Less than 24 hours after catching Fergie and company, that’s all I remember of their time in the limelight. I so wish that we had got Muse like so many other stops on the 360° Tour! Hey everybody, read and join in the effort! I signed the petition earlier today! 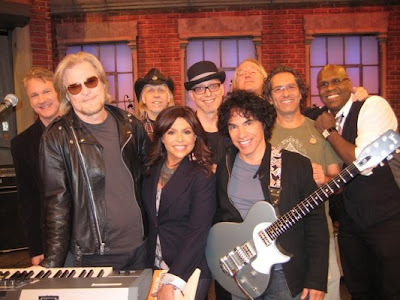 Fueling the uproar is the success of 'Do What You Want, Be What You Are: The Music of Daryl Hall and John Oates' (RCA/Legacy), the duo's first ever box set, which debuted at #89 on the Billboard chart this week – the third highest CD box set debut of 2009 behind the two Beatles sets – and #17 on the R&B chart. Critics are effusively praising the "unsurprisingly excellent" (Washington Post Online) set, saying 'Do What You Want...' "will make fans' dreams come true (woo-ooh!)" (Entertainment Weekly). The Huffington Post declares that the "74-track assembly truly is one of the best box sets ever released." Note: This review was originally posted on the Orange County Register's Soundcheck Blog on Sunday, Oct. 11, 2009. Jack’s Fourth Show, the latest daylong bash presented by Southern California’s Jack FM radio affiliate, boasted one of the most bizarre bills in memory, a mix of favorites from the late ’70s and early ’80s that spanned mainstream rock (Eddie Money, Foreigner), cutting-edge alt-rock heroes (the B-52’s, above, Joan Jett and the Blackhearts), funk pioneers (George Clinton & Parliament-Funkadelic), new wave also-rans (Missing Persons) and even one of those hair bands (Ratt). But in truth, the night’s lengthy lineup -– which ran from 4-11:30 p.m. on a chilly Saturday at Verizon Wireless Amphitheater in Irvine –- was much like the station’s wide-ranging play list. Although many of the seats were empty when Missing Persons kicked things off, lead singer Dale Bozzio and the latest version of her band delivered a solid 40-minute set featuring all of the L.A. group’s classic hits. While Bozzio’s high notes occasionally sounded pinched, the work of original guitarist Warren Cuccurullo (a member of Duran Duran in the late ’80s and throughout the ’90s) was exceptional, adding plenty of bite to the old standbys. If the adage “what was old is new again” could be considered a formula, it proved successful for several of the acts this night. Songs such as the hard-driving “Mental Hopscotch” and the timeless “Walking in L.A.” were especially powerful, with the quartet displaying a bit of the magic that got them booked at the legendary 1983 US Festival alongside heavyweights such as U2, the Pretenders and David Bowie. Back in the ’80s, San Diego-bred outfit Ratt was one of several acts that gave rise to the SoCal heavy metal scene. Watching the long-haired quintet perform Saturday night, this reviewer had two observations: 1) The band’s songs are still as simple as ever, with chanted choruses and Stephen Pearcy’s lead vocals rarely wrapping themselves around anything resembling a full-fledged melody; and 2) Ratt’s approach nonetheless resulted in some headbanging tunes (“Round and Round,” “Wanted Man,” “Back for More”) that aren’t nearly as bad as I thought they were, thanks to some impressive Thin Lizzy-esque duel guitar workouts from Warren DeMartini and Carlos Cavazo. But poor Eddie Money. When he emerged to perform, the sound system was completely in chaos. There was stage noise for the first five minutes or so, making it difficult for even the most discerning listeners to decipher that he and his band were playing “Two Tickets to Paradise.” By the time he got to his next song, “Think I’m in Love,” the sound thankfully improved. Dishing out most of the Top 40 hits he scored in his heyday, Money remains a personable entertainer who pleased the party faithful with “Shakin’,” “Baby Hold On” and “Walk on Water.” But the best song of his turn in the spotlight came when he teamed with his daughter Jesse to perform “Take Me Home Tonight,” with the 21-year-old filling Ronnie Spector’s original role. Things got even better as the night wore on, notably when Joan Jett and the Blackhearts took the stage. Jett’s set might well have been the strongest of the night, with the influential singer-songwriter delivering stripped-down, straight-ahead versions of old and new material for 50 minutes. The party continued with a 65-minute showcase from the B-52’s, though anyone looking for surprises from the group was disappointed. One of the most distinctive troupes to emerge from the late ’70s new wave movement, the outfit’s classics (“Private Idaho,” “Planet Claire,” “Mesopotamia”) and newer stuff from 2007’s Funplex (“Pump,” “Ultraviolet”) blended together into one big dance mix. The pleasing harmonies of singers Cindy Wilson and Kate Pierson were terrific on the upbeat “Roam,” while the deadpan counterpoint of Fred Schneider, set against the ladies’ sweet vocals on “Rock Lobster,” couldn’t help but bring smiles despite the cold night air. I’m sure I’m not the only longtime music follower who scratched his head at the thought of Foreigner following Jett and the B-52’s, especially considering guitarist Mick Jones is the only original member left in the group. Yet the band has figured out how to capture lightening twice. Its recently released disc Can’t Slow Down debuted relatively high on Billboard’s Top 200 chart, bolstered by the voice of Kelly Hansen, who in concert sounds almost identical to original frontman Lou Gramm. I’m still unconvinced of the classic-rock credentials of songs such as “Head Games,” “Urgent” and night-ending “Hot Blooded,” but there is no question that this version of Foreigner played as if it had no doubts about those tracks’ lasting appeal. Likewise, “Double Vision” and the Moody Blues-ish “Starrider” (with Thom Gimbel playing both flute and guitar) were delivered rousingly, thanks to Jones’ guitar work and Hansen’s strong vocals. The crowd, much of which hung around until the end of the concert, seemed to love the stuff. On May 10th, 2004 Interscope Records released ‘Hopes and Fears’, selling over 5.8 million copies worldwide, and landing a top 10 spot on the Billboard 200. The album was also voted one of the “Best British Albums” ever in a Q Magazine/HMV poll, the first of two Keane albums to feature in the Top 20*. Over the course of 10 years as an unsigned band, Keane had written what was to become one of the classic albums of our time, and one of the last multi-million selling albums of this generation. It marked a triumph for the three boys from Battle in East Sussex, but it was a success not without controversy. As a debut record, it stood alone in its originality. The absence of any guitars, a powerful, almost operatic vocal delivery, and a wall of melodic sound made solely from pianos, keyboards and a set of drums. The emotion of the record gave a voice to millions. The landscape at the time was awash with new bands from across the Atlantic, and it took Keane and ‘Hopes And Fears’ to bring all the attention back to British talent. The song writing talent of Rice-Oxley, now world renowned, reaped an Ivor Novello in 2004 for Best Composer of the Year. Yet despite having written a record that united so many different people from all walks of life across the globe, its sudden phenomenal success almost tore the lifelong friends apart. For with its undisputed accolades, it quickly changed the band’s lives and threatened not only their long-standing friendships, but the career of Keane as well. Having fought against the grain for a decade around the country’s backroom bars in the back of a van, this sudden shot to fame for Keane transformed the very dynamics that had reaped them these rewards in the first place. This sweetest of victories could have turned remarkably bitter, but it created an edge and strength of resolution that had pulled Keane through from day one, and has subsequently set the tone for their future releases and successes ever since. In addition to the original tracklisting this deluxe album showcases previously un-released and rare material including early demo ‘Into The Light’, recordings from the band’s earliest Steve Lamacq and Jo Whiley radio sessions, the timeless b-side and fans favourite, ‘Snowed Under’ (from ‘Somewhere Only We Know’), and their debut self released singles. The sleeve notes have been penned by long-time supporter Steve Lamacq where he describes the first time he caught them at the Bull and Gate in Kentish Town, “there were only three of them but they sounded huge. They were independent of mind but definitely accessible”. 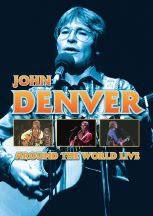 New York, NY (Oct0ber 5, 2009)—On October 13, Eagle Rock Entertainment will pay homage to the timeless singer/songwriter/performer/activist John Denver. The release of "Rocky Mountain High: Live In Japan" on DVD ($11.98 suggested price) and "Around The World Live" on a 5-DVD collection ($59.98 for this lengthy set) celebrates the life and immeasurable influence of this cherished artist. John Denver was a rare combination: an exemplary songwriter, gifted performer, and unwavering philanthropist. His peaceful vision and generous spirit permeated into every aspect of his work, touching fans all over the world. Selling more than 40 million albums worldwide, Denver’s music has acquired him two Grammys, three American Music Awards, two Country Music Awards, and an Emmy, as well as an induction into the Songwriter’s Hall Of Fame. It was his devotion to environmental and humanitarian issues that stratified him from music mainstay to cultural icon before his passing in a 1997 plane crash. The first three discs of "Around The World Live" are comprised of live performances from Australia in 1977, Japan in 1981, and England in 1986, complete with bonus tracks. Disc 4 complements the collection with a 1984 Japanese solo acoustic set, as well as a sprinkling of Farm Aid performances from 1985, 1987, and 1990. The final disc digs a bit deeper with two documentaries, each running an hour. One is an Earth Day program from 1990, and the other is a 1972 special about Bighorn sheep, which reside in Denver’s beloved Rocky Mountains. This beautiful restored footage was produced by Barry Ehrmann of Enliven Entertainment, who also produced ZZ Top’s Live From Texas DVD and Jason Aldean’s Wide Open Live & More DVD (both released via Eagle Rock). This story was posted on O.C. Register Web site: Oct. 7, 2009. World music has taken on a new twist, thanks to the Abalone Dots. The all-female quartet from Sweden will bring its fusion of pop, bluegrass, rock, alternative country-Western sounds to south Orange County for two shows this weekend. The Abalone Dots will perform at the Dana Point Community House, 24642 San Juan Ave., Dana Point at 7:30 p.m. on Friday, Oct. 9 and at the Mission Viejo Civic Center in Mission Viejo at 7 p.m. on Saturday, Oct. 10. Admission to either show is $25. Those who miss the group at these relatively small concert venues will have one more chance to see them, amid 30,000 or so fans Sunday at the Joshua Tree Music Festival. The Abalone Dots have released several albums, including 2007's "From a Safe Distance" and 2008's "Traveler." Since forming earlier this decade, the group has received rave reviews for musicianship as well as soaring vocal harmonies. The Dots recently performed at the Bluebird Cafe in Nashville, Tenn., and received a standing ovation at one of Americana music's most distinguished forums. Among the highlights on the Abalone Dots' most recent disc ("Traveler") are the country-styled "Craighead County Sky" and "A Simple Song," as well as the emotional ballad "Lost" and the bluegrass-tinged "Break the Silence." The Abalone Dots feature Rebecka Hjukström, 22 (guitar, banjo, dobro, vocals), Sophia Hogman, 24 (mandolin, cello, keyharp, vocals), Louise Holmer, 25 (bass, piano, vocals), and Elin Mörk, 24 (fiddle, vocals). Though they have been playing together only about six years, the Abalone Dots are top sellers on RCA Sweden and, thanks to appearances at events such as the South by Southwest music festival in Texas, the four musicians from a small town on the outskirts of Stockholm may soon be a top draw on this side of the Atlantic. For more information on the performances, visit www.LordOfTheStringsConcerts.com. Although Michael Glover and Robyn Rosenkrantz have shown their film “Karate Film Café” throughout Europe since its completion in January 2009 and plan to attend its Los Angeles premiere on Oct. 10, the couple is thrilled that the comedy will be screened in their hometown of Mission Viejo this weekend. 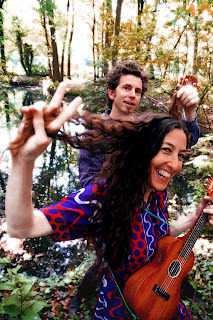 Glover and Rosenkrantz – whose musical alter ego Bright Blue Gorilla has been impressing audiences since 1990 – will perform a short set of their groundbreaking eclectic folk and exhibit their full-length film at Mission Viejo Civic Center on Saturday night, Oct. 3, 2009. “Karate Film Café” is the follow-up to the filmmakers’ wonderful “The Mind of Henry Lime” (2007), which picked up “Best Comedy Feature” honors at the SMTV Film Festival in Bombay, India. The cast of “Karate Film Café” features actors from Denmark, Holland, Italy, France, Germany and the U.S. And although the indie filmmakers didn’t have a budget to pay participants, they did provide lodging and meals for the cast and crew who worked on the film. The film was shot in Koreatown, Los Angeles in February and March 2008, with Bright Blue Gorilla than heading to Berlin, Germany to edit the film and complete post production. Both Glover and Rosenkrantz also appear in the film. “We were having such a good time, everybody put their energy into this,” Glover said. In addition to their three full-length films (including 2005’s “Sister Sarah’s Sky”), Bright Blue Gorilla has also released 11 commercial CDs that have won fans across the globe. This writer considers Bright Blue Gorilla’s 1998 album “Mantra for the American Jungle” to be one of that decade’s best musical releases. For more information, visit www.BrightBlueGorilla.com. There has always been something special about what happens when siblings make music together. The Bee Gees, Beach Boys, Oasis and Corrs are among the many groups that found success in utilizing talent found in the family tree. So it should come as little surprise that the four Johnson sisters who make up GiveWay have crafted a unique and accessible blend of Celtic music since they began playing as a professional quartet in January 2002. 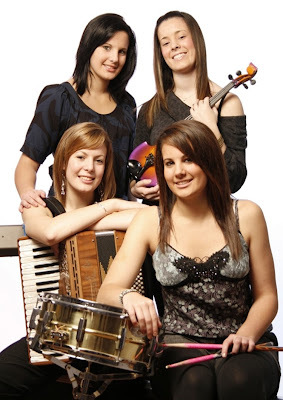 GiveWay features Fiona (fiddle, guitar, whistles, backing vocals), Kirsty (accordion, lead vocals), Amy (drums, percussion, backing vocals) and Mairi (keyboards, backing vocals). All are in their 20s. The sisters have been playing music since they were children, and since forming GiveWay, they have won honors at the Scottish music festival Celtic Connections and at BBC Radio 2's Young Folk Awards. GiveWay has performed throughout the United States and Europe, including at the Cambridge Folk Festival and Glasgow's Royal Concert Hall. The group will perform two shows Saturday night, Oct. 3, 2009 as part of the Music at the Library concert series in San Juan Capistrano. The shows will be staged at the regional library, located at 31495 El Camino Real. There will be a show at 6:30 p.m. and another at 8:30 p.m.
During the performances, GiveWay will feature songs from its 2002 commercial debut, "Full Steam Ahead," 2005's follow-up, "Inspired," and the July 2009 effort, "Lost in This Song." For more information, call 949-493-1752 or visit www.musicatthelibrary.com .